On May 25, Flying Leap Games will release the new party game Wing It: The Game of Extreme Storytelling. 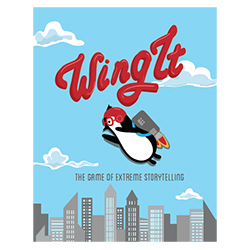 Wing It: The Game of Extreme Storytelling builds on the familiar format in which players must tell creative stories using �resource� cards in their hand that represent objects to respond to a �situation� card, with the player whose story is judged the �best� earning points. In Wing It, though, both the situation and resource cards are designed to be exceptionally wacky and improbable. Thus players may find themselves running away from carnivorous rabbits in a nature preserve while forced to rely on a Jukebox, a set of snow tires, and 38 packets of instant pudding to save them. 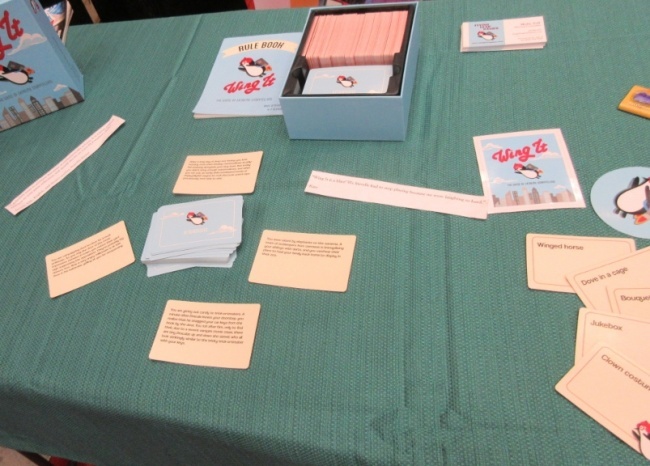 Wing It is the first title from Flying Leap Games and was created by the company�s founders Molly Zeff and Jon Cannon. The game includes 89 resource cards and 330 situation cards, plus 5 blank resources and 8 blank situations. It is intended for 4 to 7 players, ages 12 and up, and takes less than an hour to play. MSRP is $30.00. The game will be distributed through Hit Point Sales. Prerelease is April 27, with main street date on May 25. Flying Leap funded the production of Wing It through a modest Kickstarter campaign that collected $11,739 in support from 317 backers (an average of $37.03 per backer), which concluded last September. At the GAMA Trade Show, demonstrations attracted crowds several times, Hit Point told ICv2.